I mean I never once said Kuzma should replace LeBron, so I dont know it keeps getting brought up. Kuzma will force the coach to play him. And let me ask you all this.... when has a player that has that mindset like Kuzma ever been willing to come off the bench? And not in the cancer sense like "Kuzma would come off the bench cause hes a team player", Im talking about which star, which hall of famer, during his formative years / going into his prime with a mindset like Kuz... trying to achieve only the best would be happy coming off the bench. His work and skills and ultimately the outcome of who he is as a player has me thinking that he'll force coaches to find him time... A LOT of time. Maybe he doesn't start, but he'll play the most minutes with the way he's rolling. AND I'M TEAM INGRAM if you were to ask me which player I'm rooting for more. Kuzma will force the coach to give him alot of minutes due to his consistent work ethic and him getting better. But I just think it gets to a point where he's not going to keep up with Ingram in the future. BI is already a better defender, can playmake and handle the ball at a higher level, has higher IQ, is younger, is probably more athletic and has the wingspan. Theres a reason Ingram was the 2nd overall pick, Kuzma's work ethic is second to none of this team, but I still believe his limit is significantly lower then Kuzma's. If Kuzma improves every single aspect of his game this summer, and Ingram just becomes a guy that can attempt 4 threes a game on 38% shooting? Ingram is still going to be the better player. Why does one have to better than the other? That may not be a question of who’s better as much as it is of who fits better within the lineups. If Luke thinks there is only a marginal difference between the two, the latter may hold more weight in determining who starts. And I think Kuz fits better next to LeBron despite Ingram having more potential and probably being the better overall player. This decision is the most interesting one to me because it’s the only positional battle between two young players who were both drafted by the Lakers. That's what I think too. Who plays better with who. So what's Kuz's new nickname? We could just start LeBron at SF and Kuzma at PF. 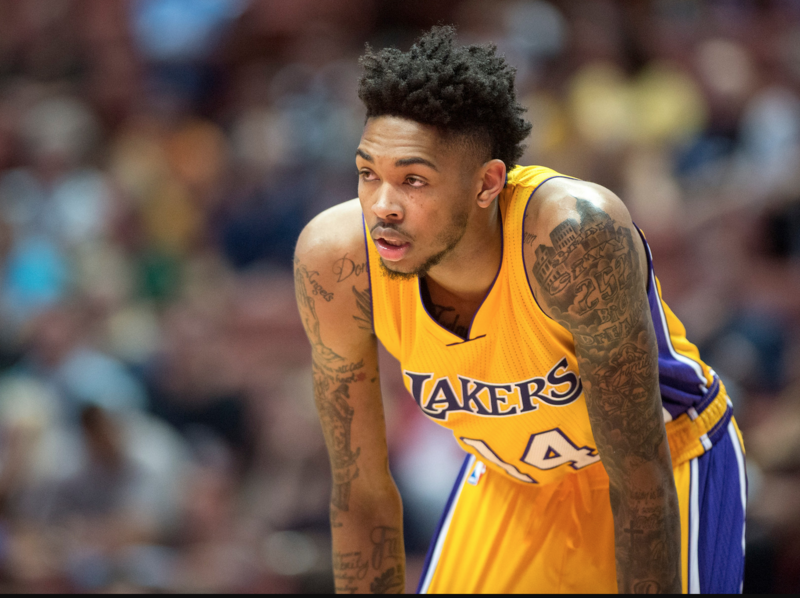 Since Ingram can do a little of everything then he would be the perfect type of player to come off the bench. I prefer Kuzma's game out of all of young core and he's by far the best shooter to me. I get that with Lebron most of the certainties with the young core is out the window, but as the 2nd pick who started the majority of his first two years that spot is Ingram's. Benching him at age 21 after two years of consistent development makes little to no sense and would be brought up alot by the national media, they'd probably trade him before benching him. Also this "best fit starts" happens ALOT less then people believe, the better guy usually ends up starting unless theres a good reason not too. I honestly think that outside of Lebron, healthy Lonzo and Ingram are locks to start. You gotta ask yourself are you a Lakers fan or just an Ingram fan? Lonzo, Ingram, and LeBron on the floor at the same time...meh. And I'm guessing KCP and McGee are the other two starters. Yikes. We need Kuz's shooting in there. I don't got to ask myself anything, I was posting on this sub 5 years before Ingram was even a Laker. I think Ingram is the better player with higher upside and doesn't make any sense to start Kyle Kuzma over him. If Kuzma is to start, then he should be better then his competition and he wasn't better then Ingram last season. Lebron needs more help on defense then he does on offense. ^They're both probably going to get 30mpg so it won't really matter. I'm all in Kuz though... expecting him to be close to an all-star this season. I wouldn't even be surprised if he makes it. He just has that "it" factor. I'd love for Kuzma to be the Manu Ginobli or Lamar Odom of this core tbh.I know you'd assume it's cause Ingram is my favorite player, but I think Kuzma has the best skill set to be a 6th man out of the young three. Meanwhile Lonzo/Ingram are more all around type of players that should start. But it's really early into careers and anything can happen. Maybe around the league, but Luke has consistently valued fit over the best 5 in the starting lineup during his tenure with the Lakers. Now if Ingram proves to be significantly better in training camp, he’ll obviously start. If it’s a debatable difference, he’ll go with fit as he has in the past two years. If Lonzo improves his shooting to around 35% and KCP shoots like he did when he wasn’t in prison, I don’t see Kuz shooting being all that necessary. But his superior off ball skills could get him the nod next to LeBron. In the interview he didn't say he's better than last year. He said "I'm a new player now." "I did a complete 180." He's either about to show us something really special, or he's going to get exposed as a fraud. I think it's most likely the former. There is alot of chatter that Kuz fits better with Bron and maybe on offense that could be true, but defensively Brandon is the best fit. We dont want our 34 year old chasing around the opposing team's best wing scorer. That should be our best wing defender not named lbj. Kuz can hopefully make another jump on defense, but i doubt he is gonna be ready for that kind of role this year. So in terms of fit next to Bron, i believe BI is the guy. Ingram was average at Best on defense last year. Kuz was below average and last year was last year. Playing with lbj on a champuonship aspiring team is incredibly different then playing meaningless games on a team of youngsters. Luke would pull Kuz because of his defense last year, while i cant remember one time BI got pulled because of his. This is only magnified playing with lbj. That goes both ways. You think Luke is gonna let BI fall asleep on D and watch his guy cut past him for a layup like last year? Everybody will be on a short leash next year if they have defensive lapses. No thanks, I gave my opinion without breaking any rules. Please mind your business.